Chinese citizens are experiencing a high level of social control as the important event gets underway. 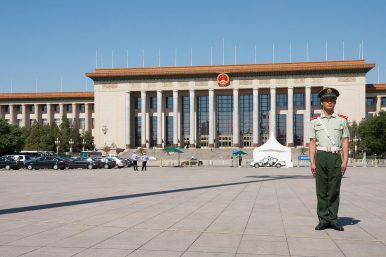 The Chinese Communist Party(CCP)’s 19th National Congress — the most important political event which takes place every five years in China’s political calendar — is set to open at 9 a.m. on October 18 in Beijing. As the clock is ticking, the whole capital city appears to be on edge. Multiple nightclubs in Beijing announced that they have suspended business, numerous websites have been closed down, and Chinese netizens have to endure the most strict internet control during the period. By the night of October 16, all 38 delegations comprised of more than 2200 delegates from 31 provincial regions across the country had arrived in Beijing, according to Xinhua. At the same time, the ordinary Chinese citizens, and Beijing citizens in particular, are experiencing a severe level of social control. Multiple nightclubs in Beijing announced the suspension of business ahead of the 19th CCP Congress. Most nightclubs said on October 15 they would temporarily close down for 10-11 days due to “uncontrollable” reasons without elaborating, according to these clubs’ announcements posted online by netizens. Days earlier, some nightclubs were raided by the police who asked customers to show their ID cards and submit to urine tests for drugs. “A music and dance club cancelled shows planned for the two weeks around the congress, but said it was ‘too sensitive’ to say why,” The New Indian Express reported. On the Internet, control is also quite tight. Weibo has already hired 1,000 “supervisors” from among its users to conduct censorship. And it announced on October 17 that due to a “systems upgrade” involving a series of functions including personal information revision, private group’s information revision, and overseas clients registration, it would be suspended until October 30. Weibo had used the same “systems upgrade” excuse to block overseas users from posting videos and photos during the period of the 28th anniversary of the June 4 Tiananmen Square crackdown. Meanwhile, a large number of Chinese colleges and universities have forbidden external networks from visiting their secondary sites of the school websites; restricting access only to the intranet. For example, you can visit Peking University’s official website at www.pku.edu.cn , but you cannot open the secondary website of Peking University’s library at www.lib.pku.edu.cn. According to China Digital Times, at least 23 top Chinese universities have carried out the measures. Beijing is keeping to a high growth target, while adopting new measures to grease economic wheels.